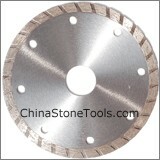 Diamond Dry Cutters (Small Dry Cutting Diamond Saw Blades) for fast cutting Kinds of Hard, Medium Hard, Soft Stone, like Granite, Marble, Sandstone, Limestone etc. and other Construction Materials. Our Diamond Dry Cutters are highest Ratio of Performance to Price! Made in China. 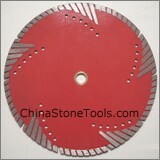 Before mounting the saw blade ensure that the machine cannot start (pull out main plug). 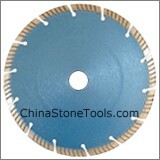 Rotational direction arrow of the saw blade has to match the spindle rotational direction. 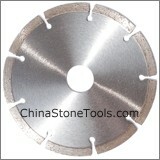 Not suitable for grinding – grinding can lead to serious injury through segment break outs. 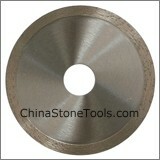 Saw specification has to be appropriate for the material to be cut. 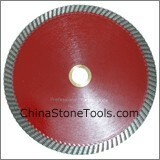 Do not tilt the saw blade in the cut. Do not carry out any curved cuts. 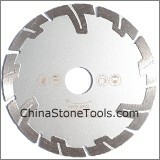 Allow cooling down breaks, if saw blade is sparking heavily (use reciprocating cut). 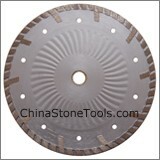 China Stone Tools Online Shop is not responsible for any accident due to wrong operation!